Well, not really. But from now on I will mostly be co-blogging with greengolux at the shiny new Vector editorial blog. Reviews, links and such will appear there; this journal is basically going to be a friends-only personal journal. So, if you want to keep up with the actual content, you might want to friend the lj feed, torque_control, or add this to your bloglines subscriptions if you don't have an lj. The other thing that will appear on the blog, obviously, is information about upcoming issues of Vector, and updates to the equally shiny new Vector website (designed and built for us by claire_weaver, who deserves many thanks, and possibly an award for putting up with our many niggling comments). For instance, at the moment we have columns by Graham Sleight, reviews by Paul Kincaid and Paul Billinger, an article about manifestos and movements by Martin Lewis, and Matt Cheney's thoughts on 2005's short fiction. More soon. Enjoy! As you can see, the actual AGMs are confined to a short period either side of lunch, and the rest of the time is given over to panels and guests (Bruce Sterling!) and such. All welcome, so why not come along? I don't know, you wait a month for a BSFA meeting, and then two come along at once. This evening's meeting (again, open to all, just organised by the BSFA) is back in the Star Tavern in Belgravia. The guest is Ian R. Macleod, author of The Light Ages and The House of Storms, the wonderful novella 'New Light on the Drake Equation', much else, and twice-winner of the World Fantasy Award. The interviewer is, er, me. The fun starts at 7, although plenty of people will be around before that. Come along! N.B. Yes, it's a Tuesday not a Wednesday, for this month only, because the Clarke Award is tomorrow. A somewhat flying post to say: James Morrow is in London and being interviewed this evening by Graham Sleight at the Hogshead on Dering Street (map here, nearest tube Bond St). This is an event organised by the BSFA, but free to all; there will be people at the venue from 6pm, and the interview starts at 7pm. If you need further enticement, by a remarkable coincidence, today Strange Horizons has a review of Morrow's latest novel, The Last Witchfinder. EDIT: almost certainly too late to be of use, but the Hogshead changed its name about a fortnight ago; it is now Bonds. There is a sign in the door. 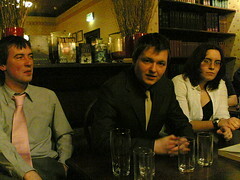 - Dan (above centre) heckling the audience as much as the audience heckled him. - The cheerfulness with which Liz (above right) called Dan a wronghead. - Andrew: "Complaining Accelerando is about people who are still a bit like us is like complaining that post-nuclear-holocaust stories aren't about piles of dust." - Martin (above left)'s opinion of the shortlist: there's always a lower place. - General agreement on the brilliance of Air. - The many many books I came home with, including the beautiful Polder. All the coolest people are going to be there (I got bored, so I'm not linking everyone), so you know you want to come along and argue with Dan too, right? Star Tavern in Knightsbridge; starts at seven, but people will be there from about 5.30. Here's a map. P.S. In other news, Hugo nominations discussion here. Yes, it's the first issue of Vector to be co-edited by greengolux and myself, complete with first-issue typos. Given that we've been editors-in-waiting for about a year, this is quite exciting, and we're proud of the lineup--many thanks to everyone who contributed. Although obviously, future issues are going to be even better. A proper website, with some online content and everything, will be along Real Soon Now. In the meantime, Vector is available to BSFA members (along with some other magazines), so you know it only makes sense to join. Contributers can expect to be hassled for their real-world addresses so that we can send them copies. The shortlists are out. Discussion here. As of today you have one (1) week to send in your nominations for this year's BSFA Awards. To reiterate: nominations close on 21st January. Emails containing nominations should be sent to awards[at]fishlifter.demon.co.uk. Easy, right? The redesigned and much-improved BSFA website is now live. Among other things, you can now join online by paypal. (and so, among other things, make sure you'll receive Matrix and Vector). Announcements will be made on the BSFA news community, which is copied to the website but which you may want to add to your friendslist anyway. If you're not on lj, the RSS feed for this community is here. All credit for this redesign goes to tamaranth. Two scottish gentlemen (waistcoats and cigarettes and all), sitting in a smokey, slightly dingy cellar bar, discussing esoteric points of philosophical, political and historical theory: it sounds almost like a scene from a Ken Macleod novel, and it almost could have been, except for the fact that the event in question was an interview of Macleod himself (introduced as 'the greatest living libertarian trotskyist science fiction author', or similar), conducted by Telegraph journalist Andrew McKie, with an attentive audience all around.